The Bermuda World Heritage Site Management Committee of Bermuda is inviting the community to an open consultation session to take place the evening of Wednesday January 23rd, at which the committee will seek public input for the 2020 to 2025 management plan for Bermuda’s UNESCO World Heritage Site. 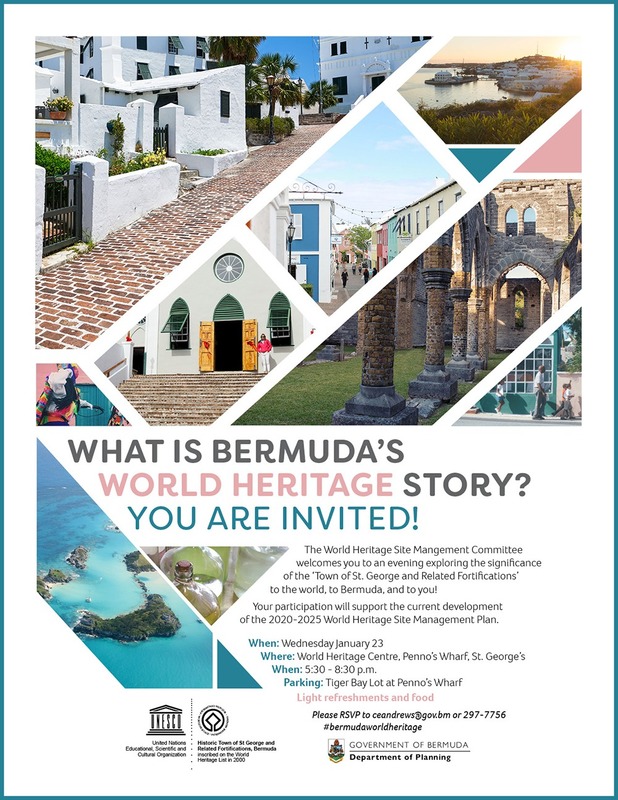 The Bermuda World Heritage Site Management Committee is holding the session entitled ‘What Is Bermuda’s World Heritage Story?’ to involve the community early on in the planning process, which will be followed up throughout 2019 with additional public consultation phases. Participants at the January 23rd session will brainstorm together on the significance of ‘The Historic Town of St. George and Related Fortifications’ as an outstanding example of a “continuously occupied, fortified, colonial town dating from the early 17th century, and the oldest English town in the New World”. “Our Bermuda World Heritage Site has been designated by UNESCO as being important for all humankind,” said World Heritage Site Management Committee Chair Cheryl Hayward-Chew. The Minister of Home Affairs Walter Roban said, “The World Heritage Site Management Plan is a critical tool to maintain and utilise our UNESCO World Heritage status. In the lead up to the January 23rd open consultation session, the Bermuda World Heritage Site Management Committee will be posting on social media to share information about Bermuda’s World Heritage status and to ask the community how and why the World Heritage Site is important to them using the hash tag #ourbermudaworldheritage. The session on January 23rd will be held at the World Heritage Centre at Penno’s Wharf in St. George’s starting at 5:30 p.m. with parking at Tiger Bay. For more information and to contribute to the management plan process, please see Facebook page “Town of St. George and its Related Fortifications World Heritage Site”. If you plan to attend, please RSVP to Dr. Charlotte Andrews at ceandrews@gov.bm or 297-7756.